The most intuitive and feature-rich home and interior design app. Layout floor plans of any complexity and experience your house design with interior 3D visualization and walkthrough your future home. • Project Gallery contains floor plan and interior design ideas (kitchens, bathrooms, living rooms, etc). • Share your interior and house designs between iOS, macOS or Windows 10 devices. 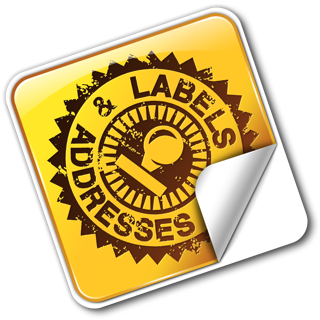 • Free access to video tutorials, online Help, Quick Start Guide and quick technical support. • Trace the imported floor plan or draw your own house plan from scratch using the Straight Wall, Arc Wall, or Room tools. • Customize the 2D representation of your furniture. 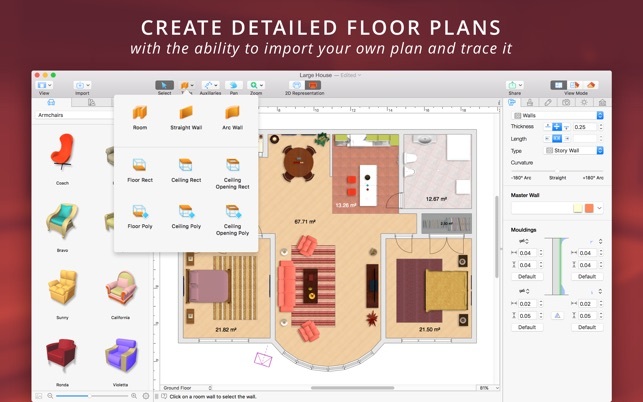 • View real-time dimensions for walls, ceilings, and floors when drawing in 2D Plan view. • Precise positioning achieved thanks to smart guides and object snapping. • Diverse measurement units supported (inches, feet, meters, etc). • Walk through your 3D interior design. • Add and move furniture and other objects, apply materials. • Set multiple cameras to see the house or its interior from different angles. 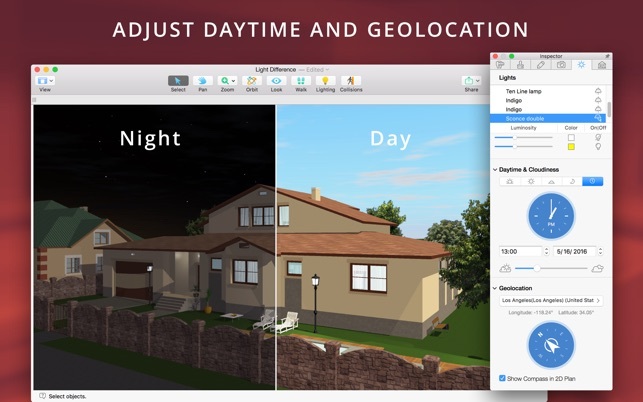 • Achieve natural lighting by setting up true geolocation, daytime and overcast. • Adjust light fixtures throughout the house to get realistic lighting scene. • Create corner windows and complex openings. • Soft and natural shadows. • 2,000+ furniture and other models for diverse home design styles. 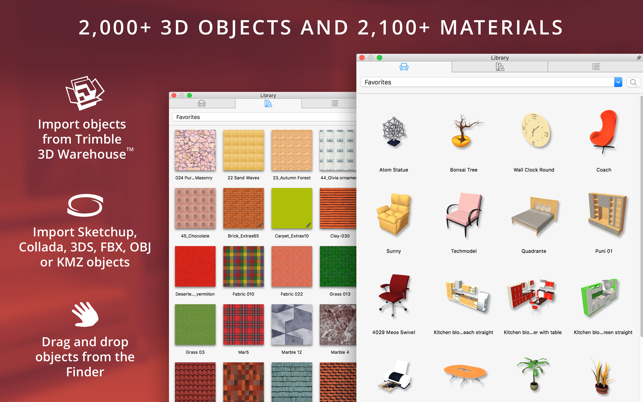 • Import thousands of free models from Trimble 3D Warehouse. 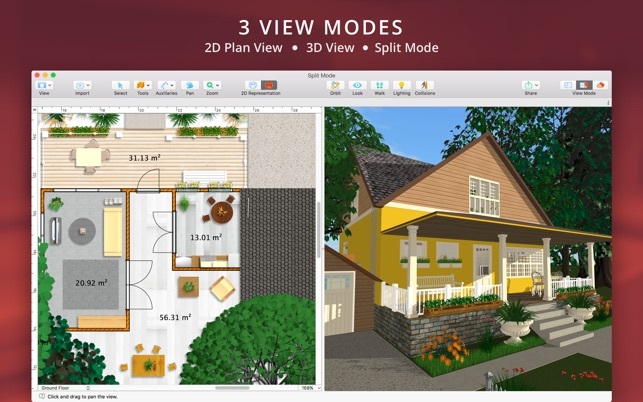 • Export 3D views of the house design to JPEG, TIFF, PNG, and BMP. 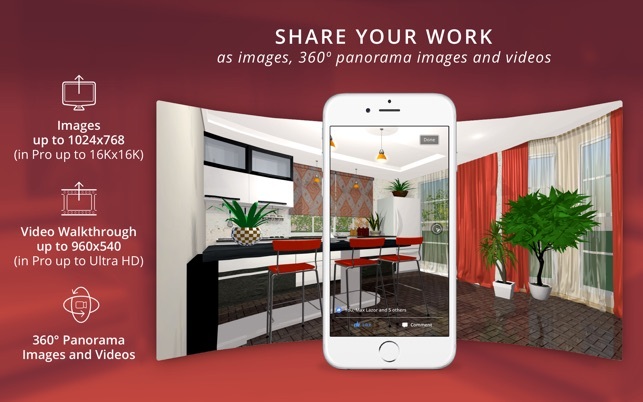 • Render a realistic home interior and exterior walkthrough videos. • Quickly send a copy of your home design via Mail, Messages or AirDrop. • Export the entire home design project or selected objects to COLLADA, Trimble SketchUp™, VRML Version 2.0 or X3D format. • Polygonal-based Block tool for drawing balconies, porches, and more. • Export to 3DS, FBX, USDZ and OBJ formats. • FOV (field of view) and parallel camera projection. • Export quality extended to Ultra HD for movies and 360° Panoramas, and to Hi-res (16000x16000) for still shots. • Light editor helps to add a light source to imported objects. • Minor bug fixes and stability improvements. Nice mixture of accessibility and precision, as needed. Easy to create rooms and walls, and to add windows, doors, and openings. The range of materials is pretty good, and easy to apply. It is easy to create and set camera views. Working in the split screen — half floor plan, and half 3D view — makes changes and additions immediately understandable. Access to the Trimble 3D Warehouse is great: There is a huge number of options for furniture and other elements in your interior; almost all allow customizable dimensions. The only noticeable lack, for me, is the range of light fixtures. Only the light fixtures in the software act as light sources (customizable for intensity and other attributes); the light fixtures in Trimble 3D Warehouse don’t offer the lighting functionality (at least what I’ve found). To achieve relatively realistic lighting and shadows, you need to use the limited range of fixtures in the software. Great Program for the Price! I had to take a blank space and try to figure out how to make it into a 1 bedroom apartment with a galley kitchen. I also had to identify how to redesign an outside patio into a entry way with storage and a full bathroom with an incorporated laundry area. Lastly, I added funiture to exact size to see if eveything that I had fit. I have to see that this tool allowed me to do everything. It even let me set up camera views. This application is AWESOME!!!! I'm sure there is more powerful design software out there, but for the cost you get quite a bit of functionality. I started with the free version but quickly became frustrated with the limitations on the roof design. Upgrading to premium for $30 allows you to build roofs one section at a time rather than relying on autoroof for the entire floor. Still missing is the ability to build porches and decks. If it's there it's not easy to find.